First Line: Their first move against us was so small, such an infinitesimal blip against the blaring background noise of life, I didn't register it as anything significant. Judge Scott Sampson's life is about as close to perfect as it can get... until his six-year-old twins are kidnapped. He and his wife Alison are thrust in the middle of a never-ending nightmare when the phone rings and a man tells Scott to do exactly as he's told in a drug case he's about to rule on. And Scott is to say nothing to anyone or the consequences for his children will be dire. As Scott races feverishly to prevent a miscarriage of justice and to bring his children home safely, his marriage begins to falter. How on earth is he going to be able to succeed? 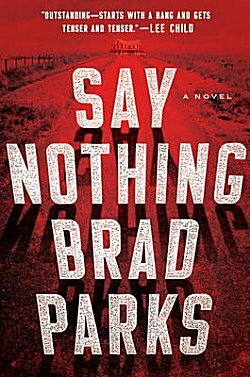 Since I am a diehard fan of Parks' Carter Ross series, I had to get my hands on a copy of Say Nothing. Would he be as good as Linwood Barclay at writing a novel of domestic suspense? I just had to find out. The best parts of the book for me were the scenes involving the two six-year-olds, Sam and Emma. The story just shone whenever they appeared, and the tension wrapped itself around me like taut barbed wire as I read. The most interesting part of the plot for me was trying to figure out exactly what was going on. When Scott thought he had everything figured out and that he knew what the kidnapper was after, the plot would take a left turn and head off in another direction. I really enjoyed trying to put all the pieces together ahead of Scott. In the final analysis-- even though the plot and pacing were first-rate-- Say Nothing fell a bit below Parks' Carter Ross mysteries for me. Why? The characters. Even when some of Alison's behavior was explained, I still didn't care for her, and although I felt for Scott and the impossible situation he was in, I never really warmed to him either. I think it's a case of being spoiled by the author's other cast of characters, and that means I had a more subjective reaction to the book than perhaps I should have. Is this going to prevent me from reading Parks' next books? Of course not! He's a marvelous writer, and I don't want to miss a word. So, how does Parks compare to Linwood Barclay's books about regular guys being stuck in the middle of murder and mayhem and having to find their ways out? For his first standalone thriller, I think he compares to Barclay very well. I've heard good things about this one, Cathy. And I've heard it relies more on psychological tension than on violence, which is always good. Still, if you don't really care about the characters, it is harder to really get into a book.